Tusk Tec-Core Batteries are premium quality batteries designed to meet the high demands of the power-sports industry. 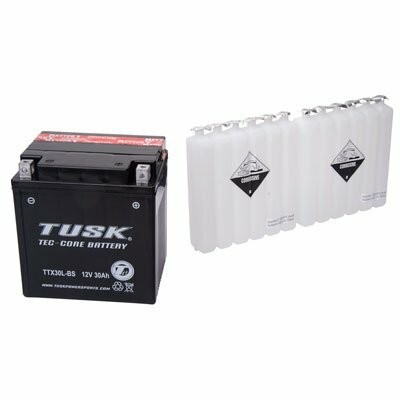 The Tusk Tec-Core Maintenance-Free Battery comes complete with a pre-measured electrolyte (acid) pack that makes filling the battery simple and accurate (always refer to safety instructions and wear safety glasses when filling any battery). Once the battery is filled, a non-removable cap is installed to completely seal the battery � you never need to add water. When it comes to quality ATV, UTV, and motorcycle batteries, think Tusk Tec-Core Batteries. Every Tusk Tec-Core battery comes with a 6 month warranty. Advanced lead/acid core technology ensures dependability and longevity. Maintenance-free means you never need to check fluid levels or add water. Complete with acid pack that makes filling simple and accurate.